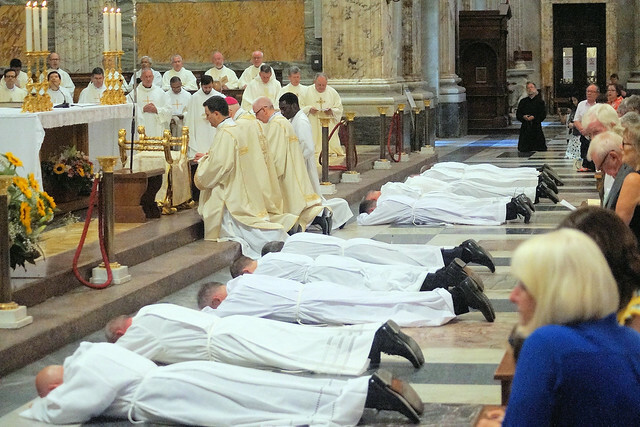 Three Diocese East Anglia seminarians, who were ordained as deacons in Rome earlier this week (June 13), all have different vocation stories. Born in Cape Town, South Africa, Alan Hodgson (pictured above) became an aircraft fitter when he was inspired by a group of Redemptorist priests who held a parish mission and whom he joined briefly. He moved to the UK and worked his way up to becoming a successful Operations Manager for Gatwick Airport but felt there was still a gap in his life. He met Bishop Alan and was allowed to work in the parish of Bury St Edmunds under the care of Canon Mark Hackeson before enrolling at the Beda College. “When I look back at my life, at the young boy in South Africa who approached the Redemptorists in order to fulfil his dream and God’s call to be a priest, I cannot believe that I have finally made it to ordination and that God has been so generous to me,” said Alan. Mike Brookes was raised in an Anglican family with a strong sense of offering service to others, and after university followed a career in psychiatric nursing. He was received into the Catholic Church in 1991 and later spent four years with a religious order before discerning that his future did not lie there. “After leaving I felt a strong sense that God was guiding me towards the discernment of diocesan priesthood, a vocation which I had not previously considered,” said Mike. “My love for East Anglia centres on both its natural beauty and my strong devotion to Our Lady of Walsingham, and so I began my application to the diocese in early 2014, and for three years now my time has been split between St Marks Ipswich and the Beda College. Paul Spellman is linked with Our Lady and St Joseph in Sheringham. “My time at the Pontifical Beda College has been one of immense personal growth,” he said. “One that has required me to listen more closely, like Elijah was asked to do, to the whisper of God’s voice and to bend my ear to hear what it is God is asking of me. “Living in community has helped me to see the richness and value that it offers both to the individual as well as the group as a whole. I believe strongly that this is a true reflection of Christ in our world and why Jesus wants us all to be people who share our lives with those around us. “My experience on pastoral placement in Palestine last summer further challenged that sense of community, especially in light of the daily experience the Palestinian people I was with have. For a full picture gallery click here or see below.